Ultra thin titanium ring with a low profile depth of just 1.2mm compared to the majority of our titanium rings on the website which range from 2mm - 2.5mm. 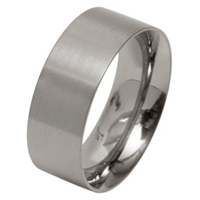 The titanium ring is 4mm in width and is flat on the outside with two grooved tramlines running around the ring. The ring is available either in a matt or polished finish. We feel that the matt finished ring is far better as the polished tramlines give a nice contrasting finish against the matt. The picture is off the matt finish. Breathtakingly lightweight and seriously practical, this cutting edge ring has been introduced due to feedback received about some clients not finding standard rings comfortable to wear. This ring is ideal for the sports enthusiast or for the person that does not like the feel of a ring on their finger. This titanium ring is made by Prism Design, a UK company and branded under their very successful Ti2 range.